The Beach Lifestyle in Fernando de Noronha. Plunge in the delicious beach Lifestyle in Fernando de Noronha. Get advice from our team of local experts. The island of Fernando de Noronha is covered with a number of beaches, pristine and untouched. The authorities have taken upon themselves to preserve their beaches in its natural beauty. The sand on most of these beaches is fine and sparkling white in color. Some of the beaches also have pebbles and shells covering the shore. The water is clear as crystal and one gets to see the different colors it wears. The temperature of the water is usually around 80 degrees F all through the year, which makes swimming all the more enjoyable. The island limits tourists to just 420 numbers at a time; hence there isn’t much of a crowd on the beaches. Reaching many of the beaches of Fernando de Noronha is quite challenging. For those who love adventure, this is the right place. The most popular beach on the island is the Conceicao beach. It is one of the longest beaches among the others. Porcos bay or the Pigs Bay is famous for the natural pools and marvelous scenery. Reaching the Sancho beach, one of the most beautiful beaches of the island is actually an effort, but rewarding. It takes a hike, a climb down a 100 foot ladder and a walk through a narrow passage which will finally lead you to the beach with a breath taking view. Praia do Bode or the Goat’s beach has nice leafy trees where you can easily find a spot to rest. Praia do Americano is a small beach which is mostly deserted. For those who want to sneak some private moments they can head to this beach. Baia do Sancho and Praia do Leao beaches are very ideal to relax on the soft sand. For those who want a relaxed evening by the seaside they can head to the Boldro beach just to catch the sunset. 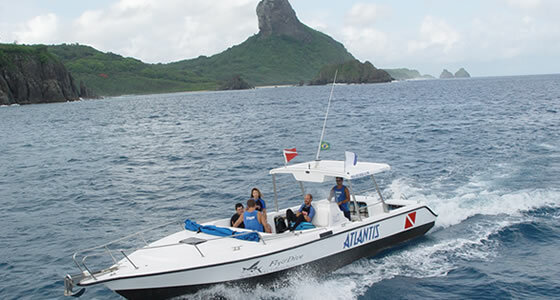 For those who love to sail on the sea, Fernando de Noronha offers a regular boat trip with several options. Each boat can take around 15 passengers. The trip will cover almost all the small islands, the dolphin bay, Sapata point and then stops at Sancho bay for swimming and diving. You have to reach the Santo Antonio Port by 8.30 am as the boats are scheduled to leave the port at 9.00 am and return usually by lunch time around 1.30 pm. You can choose to taste seafood served on some of these boats. Tourists are attracted to the marine life on the island. The island is home to over 72 species of crustaceans, 168 molluscs families and a large number of ornamental fishes which are native to the island and some migratory. Tourists can spot a variety of colored fishes, sea turtles, dolphins, octopus and many other species. While you are on the Quixabinha beach, you will spot sea birds of the pelican species. You can spend time here watching these birds hunting for food in the water, but make sure to maintain low noise levels. Viuvinha rock, a small island is covered with birds’ nests and the high cliffs on the Sancho beach is nesting ground for birds. This is the best part of the vacation. Nowhere else will you get to explore the under-water variety than in the waters of Fernando de Noronha. You don’t need to know diving or snorkeling, professional instructors will assist you and you can enjoy this adventure. Praia do Atalaia offers scuba diving for tourists with written permission obtained from the National Park authorities. Only 30 divers are permitted to dive, so it is first come first basis. Using sun tans, lotions, sun screens or any kind of sun block is prohibited. This is to preserve the water and its life from any kind of contamination. Sueste bay, well known as the turtle bay is a breeding ground for sea turtles. So all kinds of activity on this bay is completely banned between the months of December and June. However, you can watch these sea turtles breeding. The rest of the year, tourists are allowed to snorkel with the turtles. Fernando de Noronha is a surfing paradise for those who enjoy surfing. The beaches seem to break some of the best waves making the conditions ideal for surfing. Cacimba do Padre is known to produce some of the heaviest and longest waves measuring anywhere between 2 ft and 12ft in height. During summer, the waves rise up to 5ft in height. The 150m long Americano beach is also known for good surfing conditions. Praia do Boldro water is dominated by flat and sharp coral ground that assists in creating perfect tubes for surfing.